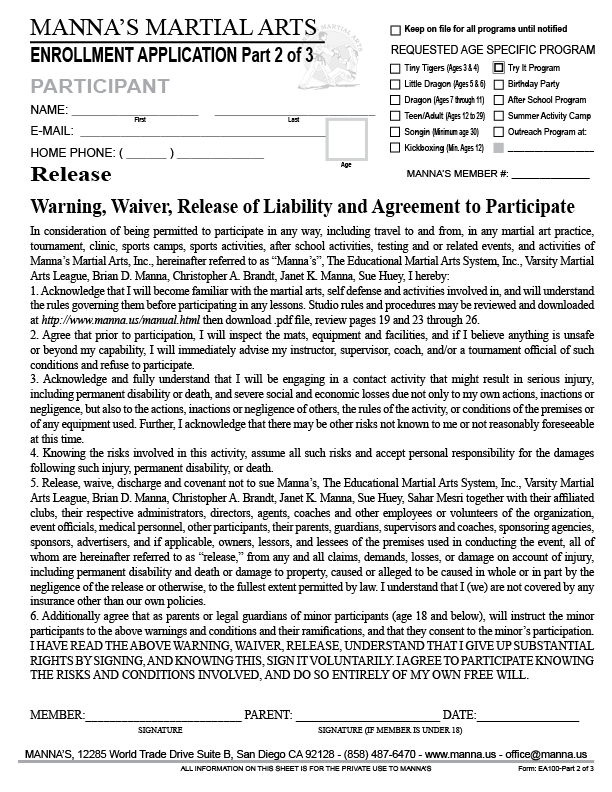 Each participant to the Summer sports Camps must have a current Release and Consent To Treat form on file at Manna's Martial Arts. 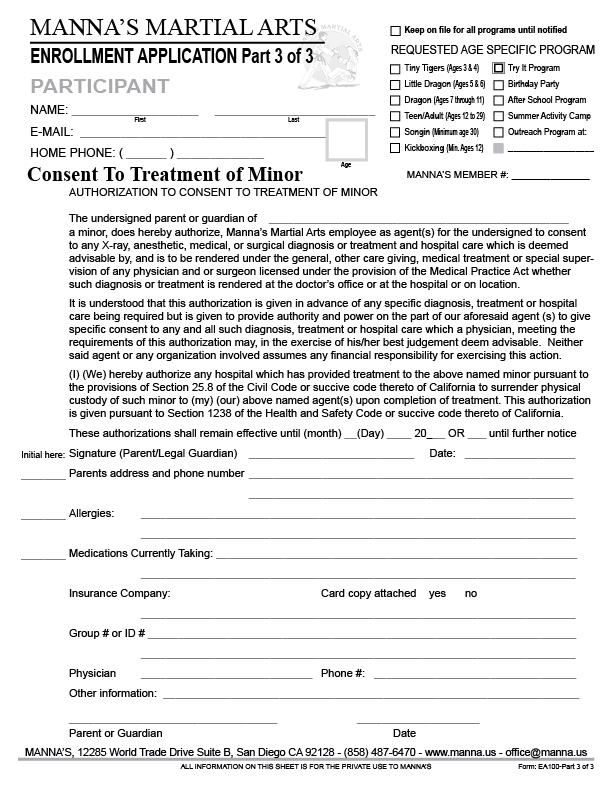 Participant are required to complete Enrollment and Permision slips. 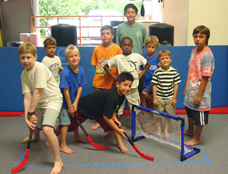 provided a safe, secure, and well-rounded experience for children ages five and older. parents can experience a sense of security knowing their children are taken care of. MANNA'S SUMMER SPORTS CAMP is supported by an Amazing Staff. This program offers an alternative to day care and other extended school programs. 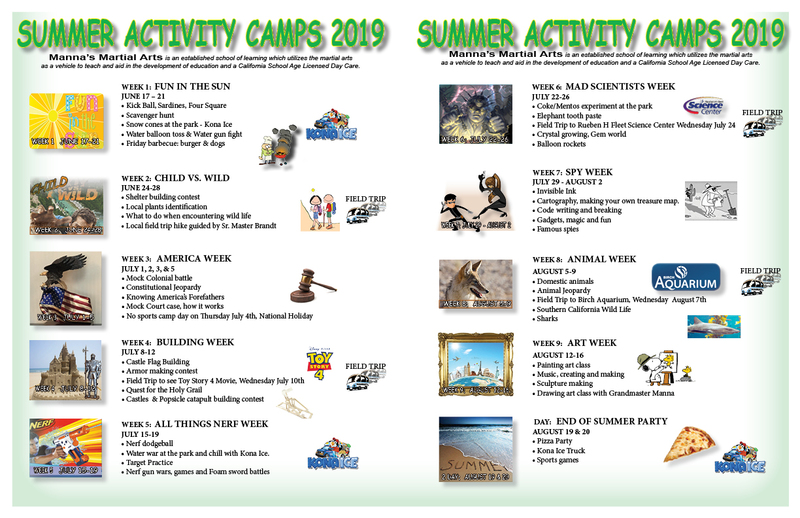 Provide your child or children with a fun filled week or entire summer of activities, creativity, games and field trips to creat memories of a life time. Your child or children will have the opportunity to continue or learn self defense through the martial arts program. MANNA'S meets our communities needs in an environment of safety, respect and discipline. WHILE ATTENDING MANNA'S SUMMER SPORTS CAMP, children will experience a wide variety of sports, outdoor activities as well as arts and crafts. Children will participate in morning martial arts classes each week as well as days at the local community park and pool. Children will get an opportunity to learn and improve their chess skills each week. Children will have the chance to meet new friends, increase social skills, and enjoy field trips to different locations, such as Hikes, Rubin H. Fleet Science Center, a first run movie, throughout beautiful San Diego. The caring and enthusiastic staff members provide a nurturing environment for the children to grow and expand their different mental and social skills. Sport activities and CHESS CLASSES. Focus, confidence, respect, discipline and LOTS OF FUN! 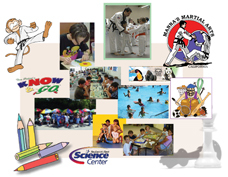 MANNA'S MARTIAL ARTS FLEXIBLE HOURS of operation allow parents to drop off their children as early as 7:00 AM and pick up as late 6:30 PM. Beginning the day after the Poway Unified School District ends and running until the day before school begins Manna's offers anywhere from one to five days of camp each week. Poway Unified School District weeklong breaks are also available through the year as a way to provide additional support to working parents. WE ARE A CA LICENSED SCHOOL AGE DAY CARE - WE MAKE CHAMPIONS!!! All Teachers and Instructors meet Day Care requirements and are DOJ Live Scanned. Participate from one to five days a week, you choose.